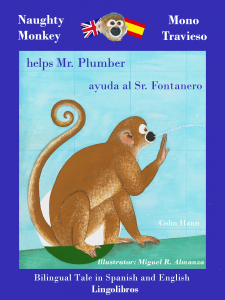 Naughty Monkey Helps Mr. Plumber – Mono Travieso ayuda al Sr. Fontanero. The Naughty Monkey series hopes to teach children and adults alike, those simple but very useful Spanish words that many other books forget to include. When you are over there you need them, you really do need them! In this book you will learn some basic plumbing words in Spanish such as water pipes = tuberías, water tap = llave del agua, and some tools that a plumber uses in his daily work. This bilingual tale is recommended for children and Spanish language students with a basic or intermediate knowledge, who want to read a dual language text in English and Spanish. This illustrated book is divided into three sections. In the first part, the two languages are displayed together mostly one or two sentences at a time. Showing the languages together helps compare words and common expressions easily. The second part, the Spanish only version allows intermediate students to test their understanding and the third part is in English only. Reading this fun bilingual book will help you learn and develop your Spanish language skills. Hope you enjoy the story. Previous Book in this series. Naughty Monkey has a special talent for getting into trouble. In this story, Mr. Carpenter attempts to replace a door that Naughty Monkey has broken, but that is not easy when Naughty Monkey is watching. Reading this entertaining bilingual book will help you learn Spanish. This entry was posted in bilingual book, english, English Spanish and tagged bilingual book spanish, bilingual tale spanish, children book, learn spanish, study spanish on August 22, 2015 by LingoLibros.